One of the advantages of Moseley membership described in our membership leaflet is that volunteers can learn new skills. One of these is the long lost art of Simplex radiator tube fitting. 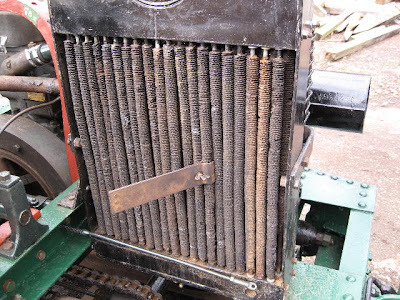 A selling point of the Simplex loco was the Davies Patent Detachable Tube Radiator, which allows individual tubes to be removed and replaced when required due to damage or corrosion. Each is a brass tube fitted with brass or steel vanes to increase surface area for cooling. The tubes are held in with individual rubber seals at top and bottom. After many years in service, the rubber perishes, the fins corrode and a rebuild is called for. This is the point at which the “individual detachability” loses its appeal, as there are approximately 70 tubes (and 140 little rubber seals) in a standard radiator. All the tubes need to be removed, the seals prised out and the top and bottom tanks thoroughly cleaned and de-rusted to give the new seals a good chance of fitting and working. After that comes the job of cleaning up all the reusable tubes, making sure that they actually pass water (a particular issue for locos from peat and clay works). Then it’s simply a matter of fitting a new set of seals (usually pinging a few of them across the workshop in the process) and re-installing the tubes. This is done by inserting the end of the tubes upwards into the top seal, then using a twisting motion to get the bottom of the tube to sink into the bottom seal. – Use soap solution (e.g. strong mix of washing up liquid) to ease the fitting of tubes into the seals. – Rubber does not respond well to blows from a hammer. – It is worth putting the effort in to ensure tube ends are cleaned up thoroughly, to avoid having to go through the process all over again. – Use of an official Simplex tool (illustrated) avoids the complete loss of skin on your knuckles through contact with the sharp vanes on the tubes. – The wearing of gloves is no protection against knuckle skin loss. – Lack of the suitable twisting motion causes the top seal to drop out. This is very annoying. – There’s always one tube that leaks at the end of the process and it’s usually on the innermost line of tubes. Fancy your chances? Contact us here.